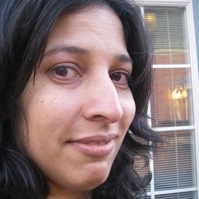 Prageeta Sharma is the author of Bliss to Fill (Subpress Collective, 2000), The Opening Question (Fence Books, 2004, winner of the 2004 Fence Modern Poets Prize), Infamous Landscapes (Fence Books, 2007), and Undergloom (Fence, 2013). Sharma’s poems and writing have appeared in Art Asia Pacific, Bomb, Boston Review, Fence, Indiana Review, The Literary Review, Vanitas, Women’s Review of Books, and other journals. She is a recipient of the 2010 Howard Foundation Grant.